Laravel 5.4 comes with pre-installation with webpack but you must have nodejs and npm install on your machine. From the root of your application, run following commands. Less :- less() method use to compile less in css. If you want to concat some plain css into single file you can use :- style() method. Webpack offers the necessary facilities to make a module available as a variable in every other module required by webpack. If you’re working with a particular plugin or library that depends upon a global variable, such as jQuery, mix.autoload() may prove useful to you. This snippet specifies that webpack should prepend var $ = require('jquery') to every location that it encounters either the global $ identifier, or window.jQuery. Nifty! It’s possible that you may need to listen for each time webpack has finished compiling. Perhaps you want to manually apply some bit of logic that is appropriate for your application. If so, you may use the mix.then() method to register any callback function. 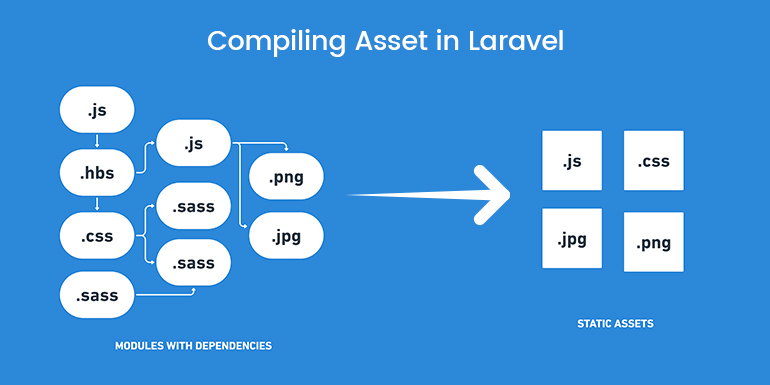 To assist with long-term caching, Laravel Mix provides the mix.version() method, which enables file hashing such as app.js?id=8e5c48eadbfdd5458ec6. This is useful for cache-busting. Imagine that your server automatically caches scripts for a year, to improve performance. With versioning enabled, each time your code changes, a new hashed query string file will be generated. Consider the following webpack.mix.js file. Above code generate different hash named file each time so you must use global mix() method in your views.